Combination (Transcutenous Nerve Stimulator and Electrical Muscle Stimulator) Digital Unit is a Dual Channel, Three Mode EMS and Seven Mode TENS unit. 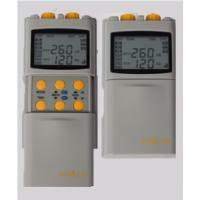 ProM-710 Digital TENS and EMS unit is simple to operate with its precise digital controls and LCD Panel Display. Large rotary knobs are used for amplitude adjustment and as On/Off switches, separate for each channel. ProM-710 also Additional Controls protected under a large sliding front panel with specially designed easy grip ridges. ProM-710 Digital TENS and EMS features 7 modes of TENS operations and 3 modes of EMS, also built in are additional features: Timer, Patients Compliance Meter, and Physician/Therapist lock feature. This TENS and EMS Combo unit is a high quality product that incorporates microprocessor technology with precise digital controls and extra large LCD display. On the back, a sturdy clip is included for carrying convenience. Lead wires (new FDA compliant). 4 self-stick hypoallergenic reusable electrodes. ♦ Three (3) Function Mode: Synchronous, Constant, Alternating. ♦ Pulse: Amplitude and Rate Adjustable. ♦ Timer: 15, 30, 45, 60 minutes and continuous. - Burst (B): Width Fully Adjustable. - Continuous Mode (N): Pulse Rate, Pulse Width and Intensity Fully Adjustable. - Modulated width (M): Pulse Width is Automatically Varied. - Modulated Rate (MR): Pulse Rate Decreases 50% from Setting Value. - Modulated Rate and Width (MRW): Alternating Modulated Width and Modulated Rate. - Strength-Duration and Rate Modulation (SDR): Alternating Modulated Intensity and Pulse Width. - Strength-Duration Width Modification (SDW): Alternating Modulated Intensity and Pulse Width. TENS/EMS Units & Stimulators can be found in our extensive online collection of products from globally recognized and trusted brands, including ProMed Specialties. An excellent option to consider is the ProMed Three Mode Digital TENS and EMS Unit with Timer, Dual Channel.